Given that things went well with my last post on Genki, I’ve decided to make a second one talking about lesson two. This one will be more focused on vocabulary, clarifying doubts that may arise, and perhaps criticizing some poor decisions on the editors’ part. The book does an adequate job at explaining the kore/sore/are, kono/sono/ano, and koko/soko/asoko sets. I won’t get too much into that. All I will do is label the first set (kore/sore/are) as demonstrative pronouns, the second set (kono/sono/ano) as demonstrative adjectives, and the third set (koko/soko/asoko) as locative adverbs. You’ll notice that there is no word given for fruit. Fruit in Japanese is Kudamono, 果物. The word Oishii is the standard word to describe deliciousness; but another word you might hear, and also worth remembering, is Umai, 旨い. Umai has a few other meanings, but it’s notably applied to food a lot. A synonym for Jisho is Jiten, 辞典, and an old fashioned term for the same thing is Jibiki, 字引. So if you look up something online and see these terms instead of Jisho, don’t be alarmed. Nooto is short for nootobukku, ノートブック. There are some more Japanese terms for the same thing: Choumen, 帳面 and Hikkichou, 筆記帳. Choumen might refer more to a log book, however, like where one would keep one’s accounts. 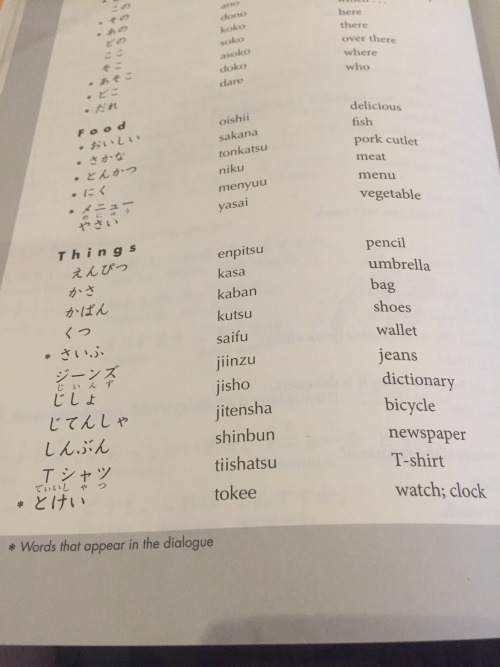 The “hitsu” in Mannenshitsu and “pitsu” in Enpitsu are the same lexeme, by the way. Kissaten refers to a traditional and fancy kind of café, not a Starbucks or anything like that.Those cafés, the ones with no real specific ambiance or are in-and-out style are called kafe, カフェ. Toire is not the nicest term for a bathroom available. If you’re going to ask where the bathroom is and you want to sound nice, use the term Otearai, お手洗い. Calling the U.S. America can be a controversial, viz. because the “America” is United States of America refers to a continent, not the country itself. So it’s a shorthand term. The American Continent is Amerika-tairiku, アメリカ大陸. North America is Kita-Amerika, 北アメリカ, and South America is Minami-Amerika, 南アメリカ. The official name of the United States of America is Amerika-gashuu-koku, アメリカ合衆国. 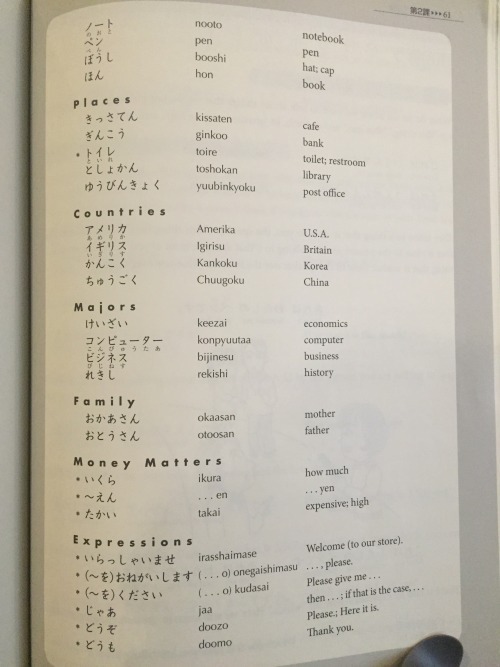 The popular term for the U.S. is Beikoku, 米国, or Amerika. We encounter similar problems with Britain, where Igirisu is a popular term for the U.K. but if you want to be more specific or technical than that you’ll need to know some more words. Great Britain, the landmass, is Gureetoburitentou, グレートブリテン島. Northern Ireland is Kita-Airurando, 北アイルランド. The United Kingdom of Great Britain and Northern Ireland is called Gureetoburiten-oyobi-Kita-Airrurando-Rengou-Oukoku, グレートブリテン及び北アイルランド連合王国. The popular term for the U.K. is Eikoku, 英国. At the moment, Korea is a divided country. While most people we encounter are South Korean, we should not act as if North Korea does not exist. The Korean Peninsula is called Chousen-hantou 朝鮮半島. The popular term for Korea (the landmass and nation before the war) is Chousen, 朝鮮. The Republic of Korea (South Korea) is called Dai-Kan-Minkoku, 大韓民国. The popular term for South Korea is Kankoku, 韓国. The Democratic People’s Republic of Korea (North Korea) is called Chousen-Minshushugi-Jinmin-Kyouwakoku, 朝鮮民主主義人民共和国. The popular term for North Korea, because God knows nobody has the time to say the full name, is Kita-Chousen, 北朝鮮. I’ll just point out that in many places there is no “computer” major. If you are studying Computer Engineering, then in Japanese that’s Keisanki-Kougaku, 計算機工学. Computer Science is Keisanki-Gaku, 計算機学. Computer programming is referred to as Konpyuuta no Puroguramingu, コンピュタのプログラミング. Ikura is an important term. 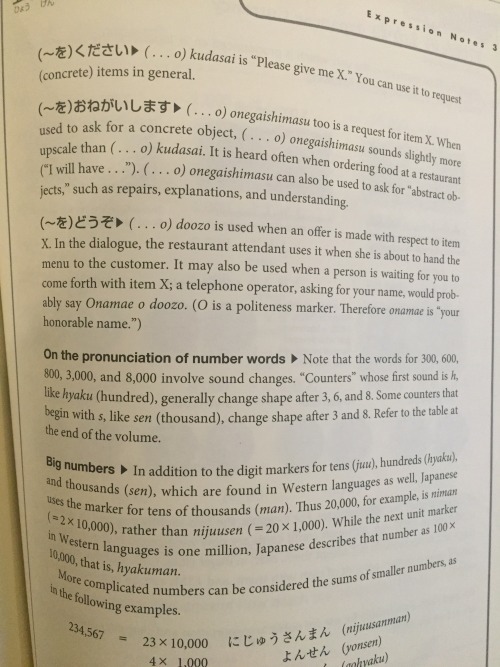 Another you should know is Ikutsu, which means “how many,” and is also used when asking for a kid’s age. My understanding is that it was a popular sentence used in Japan when teaching English; and at this point is just a cliché. The particle Mo is what I want to call a second-tier inflection particle. What I mean by that is that it, in an inclusive way, inflects the noun, but it works in conjunction with a main inflection particle, such as Wa, Ga, Ni, and Wo. When Mo is paired with Wa, Ga, and Wo, the main inflection particle drops out, but the function itself remains. 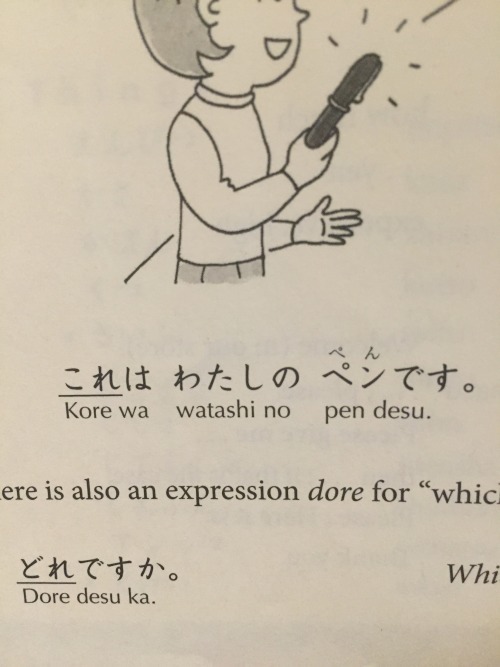 Ja nai is a contraction of the phrase De wa nai, ではない. 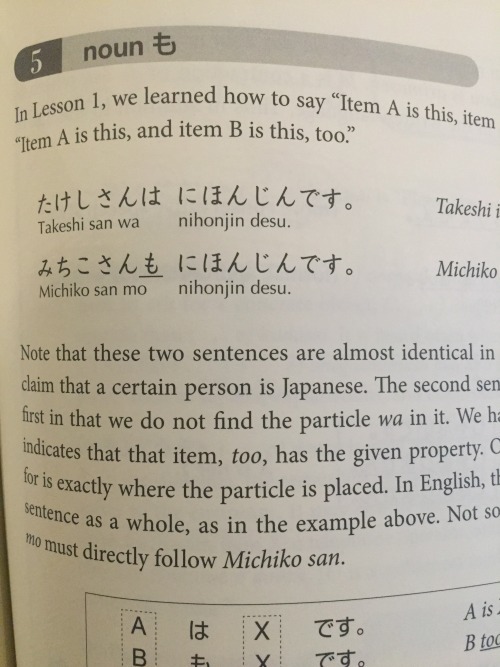 The Wa in “De wa nai” is the topic particle we already know. I’ll talk about this phrase again once you’re familiar with the “Te-forms,” which probably has no perfectly analogous term in Indo-European grammar but is often called a gerund, a noun coming from a verb. This is an important page. Read it. There are a few explanations as to how the kudasai expression came about. 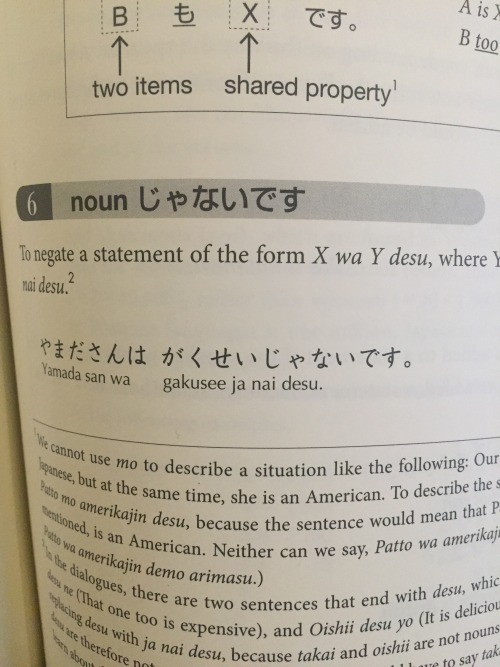 What we know for sure is that it comes from the verb Kudasaru, 下さる, which is a humble verb meaning “to give,” and literally “to lower.” What is up to debate is what conjugation/form got contracted to -sai. I believe it’s an imperative of some sort. Others believe it’s the verb stem, Kudasari, without the /r./ The problem with that is that verb stems aren’t used for requests or commands. Remember that if you just want to express your desire for someone to help you with something, in the same way that people in English would just say “Please,” then say Onegaishimasu; but if you want help with something specific, in the same way that people in English would perhaps point to something in a glass case and tell the clerk “This one, please,” then use Kudasai. 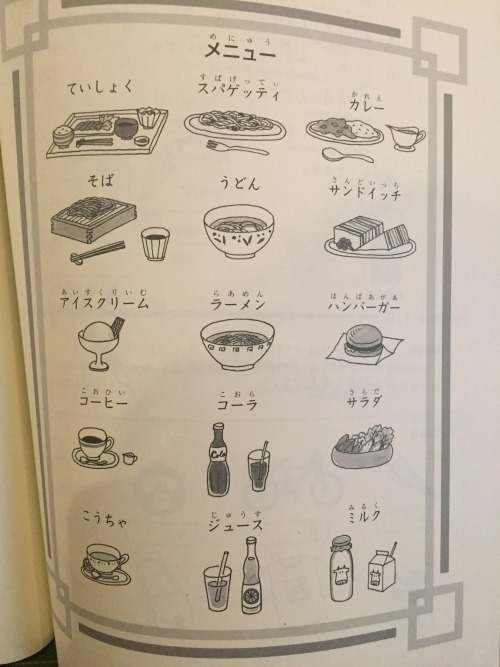 If you’re still caught up on the pronunciation of numbers, I have posts on hyaku and sen.
Lastly, I want to point some finer points regarding the food items on this page. Teishoku, 定食, is a pre-established meal which comes with miso soup and a bowl of rice. Aisukuriimu is sometimes shortened to Aisu. The shaved ice with syrup, like a snow cone, is called Kakigouri, かき氷. Raamen, known in English as Ramen, is in Katakana because it’s actually an adaptation of a Chinese meal involving that kind of noodle. It does have corresponding Kanji: 拉麺, which is the same used in Chinese. Koora is a carbonated soft beverage. Kooku is the Coke brand. Ocha, お茶, is the way one refers to regular tea, or green tea. Miruku is milk. But sometimes one hears Gyuunyuu, 牛乳, in reference to cow milk as well. Note that this applies only to cow’s milk. For milk in general, Chi or Chi-Chi, 乳, and Bonyuu, 母乳, are used.